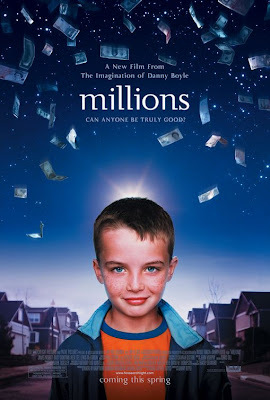 After a couple of weeks downloading this film, I finally got to watched Millions! Damian Cunningham is such a cute kid including his religiousness, simple takes in life and how he sees day to day things in his neighborhood and country. I've to constantly remind myself that this film is fictional. UK is still using Pounds, not Euro. But it's probably a good example of what's to happen in case it become real. Everyone will most likely be hopping from one bank to another converting their old pounds to the new euros, bank robberies too, are not impossible.